It wasn’t long ago that problems with a coach meant the Fuentes scandal or a police raid in Italy so yesterday’s finish line confusion doesn’t look so bad. A quick update on the bus and the gantry. Orica-Greenedge’s bus lost the air conditioning. If you watched the TV coverage closely you could see fluid spraying out of the top of the bus after the crash. The bus can’t be too comfortable in Corsica given the sunshine outside. According to RIDE Cycle Review’s Rob Arnold the gantry needs repairs. The two engines that hoist the thing into place are damaged. The hydraulics are fine but the alloy structure is damaged and should be repaired within the next two days. The structure is provided by Movico, a Dutch company who had to think quickly yesterday with disaster struck and the race was 13km away and moving at 60km/h. It was their idea to let the air out of the tyres. Talking of deflating news, it’s great to see Belkin come in to sponsor replace the Blanco team but L’Equipe suggests the teams problems might not be over as the squad risks losing one valuable accessory: bike sponsor Giant. The Taiwanese bike firm provides a reported €3 million. The sponsor is thinking of switching to supply Argos-Shimano instead and will decide in the coming days. L’Equipe again and their write Gilles Simon interviewed UCI President Pat McQuaid. Obviously we can’t see the behind the scenes work done by Pat McQuaid during his Presidency so instead we’re left with the angry press releases and confused interviews. In the latest one he says if the samples from 1998 Tour prove Marco Pantani used EPO then he’d consider stripping the Italian of his win. There were jokes about lifetime bans for Pantani on Twitter this morning but it’s no laughing matter. As the head of a governing body subscribed to the WADA Code, Pat McQuaid should know that there’s an eight year statute of limitations. More so since the matter was a crucial element of the USADA verdict on Lance Armstrong. In other words Pantani’s record cannot be revised although everyone is free to have a view on it. the 18th of July, the day of THE stage of this year’s contest, risks not being remembered for making the riders toil up the 21 bends to Alpe d’Huez twice but for something even more spiteful – the French Senate inquiry into past doping in cycling is set to publish the list of riders who returned positive drug tests fifteen years ago. But I can’t help wondering why today’s riders should be so concerned. This goes back to 1998, a time when the average rider in the Tour de France peloton was 12 years old, when President Clinton lived in the White House and Brandy and Monica topped the charts with “The Boy Is Mine”. It’s so stale it could be in a museum. It’s been said before but the riders need a union. Imagine if a united voice could project rider frustration and demand others contribute to cleaning up the mess left by the past generation? With some slick work the union could channel the media towards the likes of Richard Virenque and Luc Leblanc, each with their radio shows in July or others present like Bjarne Riis to explain what happened. Cycling fanatics will know a rider union called the CPA exists. It’s led by Gianni Bugno but near invisible. It has a website but the last news item dates from 13 June… 2012. Today saw the idea of a protest amongst the riders at the KM0 point where they’d make a symbolic stop to protest at yesterday’s race chaos. But the move was called off at the last minute. As long as the riders can’t agree amongst themselves and have no channels to stand together then they’ll have to endure more of the same, a union would be a proper way to run this rather than a peloton patron or two. Rider safety in the Tour is one thing a union could help with. Instead riders are left floating their own ideas. FDJ’s Jérémy Roy suggests that times could be taken at the 3km point. As things stand if a rider crashes in the final 3km then they get the same time as the group they were with but Roy’s rule would mean the times are taken at the 3km point. This means the GC contenders and their teams would not be mixing it with the sprint teams during the final 3000 metres in order to get their leaders across the finish line. I like the idea and it could explored. It would mean a virtual finishing line where GC teams could compete for and they might cut their effort once over this line, getting in the way of others as they drop back down the bunch. Plus there’s an element of artifice that the public might struggle to grasp. There’s an interesting analysis of bunch crashes in grand tours from 2011 that crunches the numbers. It’s conclusion? That creating the 3km rule made the racing more dangerous as riders take more risks. I’m not sure about the paper as the source data sample is small but these things are still very helpful. The Tour is popular in France with big crowds and large TV audiences. Saturday’s opening stage took one third of the TV audience in France, an impressive stat. But whilst you’re probably watching for the race, millions in France tune in for the scenery. In fact the French are surprisingly indifferent about the race itself but millions love the show and the procession around France. It’s a topic I explore more in my column for 2rHD available for iPhone or iPad users. Brandy and Monica! Nice. Armstrong was stripped of results back to ’99 though, no? How was the statute of limitations applied there? Re Jeremy Roy’s suggestion: historically, there are precedents. In days when stage finishes on velodromes were more common, the time was often taken at the entrance to the velodrome, whereas the finish was contested perhaps one and a half laps later. Saved taking huge risks with a big bunch on a tight track. Indeed, in the very early days, I believe that some stages were contested with the riders finishing at a location in the town centre to take the finishing time and sign in; then the leading riders would ride a timed lap in the velodrome later in the day, as part of a bigger track meet, in order to decide the stage result. According to De Telegraaf, Giant is to make an announcement Monday, 1 July. Makes sense Giant would stick with a Dutch team given Gaiwin B.V, under which global Giant subsidiaries are operated, is based in the Netherlands. Interesting times. Roy’s suggestion is as disgusting as Riccò’s pharmacy. More sanitization, less risk, easier rides for everybody?? Please!!!! Stop it! And Gerrans the moron defending 120km stages not long ago… Are you guys really trying to earn somebody’s fascinated admiration for your endurance? Are you really trying to achieve something very few humans could achieve? Or you’re just in it for the money and the publicity? Sorry for the tone here. Mais cette dérive me fiche les glandes, M. Roy. I can see why but also see the rider perspective, the risks are big and for them it’s a job and the idea of being sent crashing out is a big deal. As a fan I get annoyed every time I’m denied watching the best-of-the-best compete against each other because key riders are taken out by all these ridiculous crashes. The Tour loses some of its gloss as a spectacle every year when big names are continually taken out through these stupid incidents. I think Roy’s suggestion, or some variant of it, is well worth exploring. If you want to watch people getting smashed, go watch the UFC. Today’s stage does put this idea into perspective though. How would you managed this 3km rule? Fuglsang had a couple of seconds on the bunch at 3km and he’s a GC contender. But he was pulled back by teams fighting for positions for the win, not GC teams. If this rule was in place, some riders in that 6 men group would have sat up after 3km, happy they had a time gap, and it would have had an effect on the outcome. It’s so confusing, you can’t have a finish line for the stage and one for GC, especially at the beginning of a grand tour, GC and stage win ambitions all get mixed up. You would get a “sprint” anyway because riders would fight for the yellow jersey, and then another one for the stage win. In fact I see this as more dangerous!!! How about on designated flat sprint stages everyone in the bunch gets the same time unless you’re more than, say, 1 minute behind the main peloton? 2) It’s not as if sprinters or breakaways care about GC time gaps anyway. The structure is provided by Movico,… It was their idea to let the air out of the tyres. Does this mean that it’s official that nobody on the Tour staff has any common sense? There must be someone stating the obvious first, and why not the folks that found out that the gantry could not be lifted due to damage? Host cities will be none too pleased if the finish straight they paid for is just a parade of riders with nothing to contest because a breakaway has taken all the meaningful places and points some 3km up the road. Surly he meant to do the 3km thing just for sprint stages. 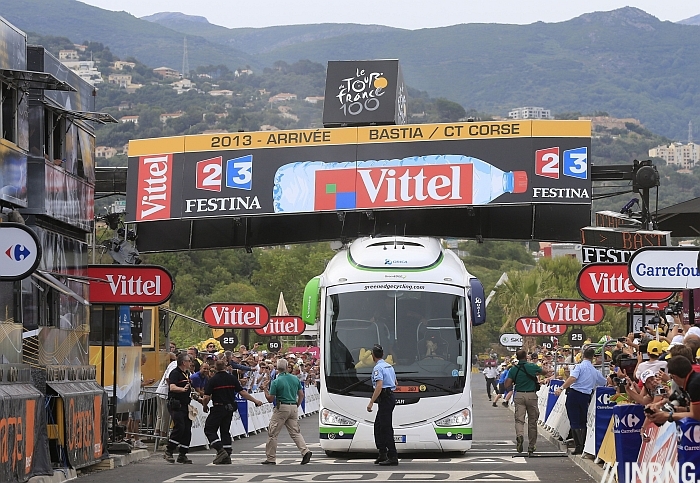 Kind of make sense as GC riders drop back, sprinters and their train would have more space to work for the stage win. Though how you define sprint stage is a problem. And that’s my point. The 3km rule as it stands applies to all sorts of finishes, and I can’t work out a way of having two finish lines that wouldn’t upset the balance of spectacle, safety, and straightforwardness of just one. As I said before, that second finish line will be terribly sad looking if there’s nothing to be raced for. You could mitigate that by adding a short finish circuit, it sounds unsafe to mix riders like that. It’s not the easiest thing to follow, either. Would breakaway riders deserve points for crossing the timing line first, or must they ride a further 3km up the road with the peloton breathing down their neck? Re the 1998 tour there is one rider in the 2013 edition who was also in the 1998 edition – Jens Voigt, who wore the polka-dot jersey in 98 for one day. He was one of the four riders who met with French Sports Minister Valerie Fourneyron on Saturday to complain about the negative press coverage following the revelations about Jalabert. Not to mention all of those not racing but still on teams’ payroll. Yeah I believe O’Grady won a stage and wore the yellow in 98. Was it possible to achieve those things clean in 98? Or is he feeling a wee bit nervous? Can the sprinters therefore sit up with 3km to go on a summit finish. Maybe the nervous decenders can put in a bid too. When Roy mentioned this his larger team mates suggested for fun that the mountain stages do this too. Sounds good, but it’s not good enough. We could perhaps do some shortish sprint stages with GC riders not even starting. That would be pretty safe for them, wouldn’t it? Interesting report on 3km rule and likely-hood of crashing. Though I’m not quite sure if the 3km rule actually raise rider’s appetite for risks. The paper’s basic assumption is that the 3km rule removes one penalty of a crash: loosing time. As a result, riders take more risks. The problem with that assumption is that in modern cycling, GC contenders do not go for sprint stages anyway and sprinters don’t mind loosing time (they probably loose a tone more on mountain stages). As a result GC riders would still take precautions with/without the 3km rule whilst sprinters would ride to hell anyway as well. The 3km rule does not affect risk taking behaviour of riders. If they do intend to reduce risk taking, they should change the rule for the green. For example, if finishing two low on a bunch sprint (say out of top 20) would deduct points then sprinters would think twice before getting to aggressive. In my opinion, the rise in crash no.s and size (if that statement is in fact statistically true) probably was a result of the perfection of sprinter trains. I had an interesting chat with a former “classics” rider from the early 90s (a Monument winner, no less) who was of the view that the severity of the crashes had got much worse in this era than in his. He is now a part-time DS for one of the big teams and he is shocked by the number of serious injuries, particularly to the upper body. He thought the biggest factors were a lack of mutual respect among riders these days – no “solidarity” – and the lack of a strong patron to pull more aggressive young riders into line. I don’t know if this is similar to the usual rose-tinted “things were better in my day” statements that one can apply to many facets of life (perhaps there are stats to disprove his theory), but I assume the 3k rule didn’t exist then, and there may well be something in that “respect for others” plea: perhaps the older riders need to re-instill a bit of discipline among their teammates? I wonder if the riders are simply more fragile because of the tremendous focus on weight loss. Bones are not static structural elements, but are alive and grow and shrink in response to applied stress. If one does no upper body exercises, then upper body bones decalcify. And the clavicle snaps in response to even minor impacts. It’s important we learn as much about the history and truth about doping, no matter how long ago or stale it might seem. While the names that emerge into public domain may not be of great surprise, there are still those with positions of privilege and influence built on a foundation of perpetuating falsehood and other’s ruined careers. The concept of a ‘remote finish’ shows up in other sports too. In gliding competition it is now common to have a finish cylinder or finish line a few km from the landing site to discourage dangerous flying over the airfield proper. This seems to moves the funny stuff rather than suppressing it, so it is not without drawbacks.